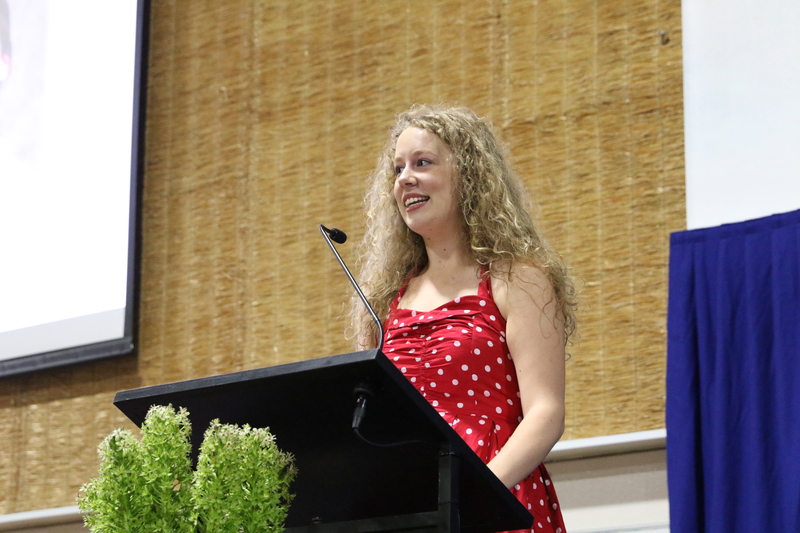 Our speaker at this morning's High Achievers' Assembly was 2017 College Dux Gemma Tripp. Gemma shared her reflections on her time at school as well as her busy 2018. There is a pearl of wisdom for everyone to contemplate in Gemma's presentation. My name is Gemma and I graduated from Mater Christi in 2017. Firstly, I’d just like to say a massive congratulations to the class of 2018. Your persistence, hard work and motivation has paid off and you’ve made it through the toughest year of secondary school. As well as the incredible academic results that have been achieved, I’m sure there were many personal goals that were also reached, and I’m so happy to be here today to celebrate some of these achievements with you. After graduating on a high, it was a difficult time when I realised that I had no idea where I wanted to go from the end of school. Like many others, the plan had always been to just make it through Year 12, but after that I wasn’t quite sure what direction I wanted to head in. I feel like now I’m in a place where I can say its ok to be in that situation, to not know exactly how you want to spend the next few years, but at the time it was confronting and scary. I decided to defer my offer of Law and Global Studies at Monash and to instead take a gap year. The prospect of a year off was quite daunting after so many years of studying, and it isn’t for everyone, however for me personally it’s the best favour I could have done myself. I started working part time and set about reconnecting with friends and family who I had not spent much time with in the craziness of Year 12. In August I travelled to Europe for two months and made the most incredible memories that I will truly cherish forever. The last year has helped me in more ways that I could have imagined. Even though I wasn’t formally studying, the learning didn’t stop. Working, experiencing different cultures and trying new things allowed me to gain knowledge and an understanding that I believe will help me in the years to come. This year I’m going into university feeling really ready and excited for the challenges ahead. My year off has given me the confidence to pursue overseas study throughout my degree, as well as teaching me about the work ethic that I will use during my internships. I feel like during Year 12 there are so many pieces of advice that you’re given, which can be really helpful, but it’s often quite overwhelming. If I had to give one piece of information that I would want people to hold on to today, it is to put the numbers out of your head. I think at the start of Year 12 one of the hardest parts I found was the pressure I felt to do well. However, as I went along I realised that the best way for me to get through the year was to forget about the ATAR, and to simply focus on challenging myself to achieve the best that I could. Instead of spending time worrying and stressing yourself about the numbers you might get, spend the time focusing on what you can achieve and change now. Focus on the challenge to push yourself to be the best that you can be. Of course when applications for tertiary studies roll around this is easier said than done, however I truly believe that if you view Year 12 as an opportunity to see what your potential is, rather than reaching for a potential ATAR, you will get through it much easier. Also, for all of the Middle School students who are here today, I’d just like to pass on a little bit of advice to you too. While VCE or VCAL are still a few years away for you, it’s never too early to start learning the habits that will help you in your later years of schooling. Ask questions, find out which subjects you enjoy and understand that your study habits now will impact how you approach studying later on. While you don’t have to sit for hours at a desk, making small changes now can make a big difference later on. I actually remember sitting over in that corner in Year Seven during the High Achievers assembly, not understanding any of the numbers or what they meant, and thinking to myself that those girls seemed so much older, and the time for graduating so far away. It goes so much faster than you think it will, so really do enjoy your time here while you have the opportunity to do so. Good luck to the class of 2019 for the year to come, you will get through the year. Year 12 is supposed to be hard, and just because you don’t understand something the first, second, third or even fourth time doesn’t mean you will never understand it. Failing a SAC does not mean that you fail as a person. Some topics or concepts will take longer to grasp than others, and how quickly you do so is completely different for different people. How you choose to move on from the tough days is where you will truly experience growth, not just in your knowledge of the subject, but also personally by knowing that you are strong enough to get through the year. Trust me, the relief you feel at the end of the year will be worth all of the work. Again, I just really want to commend the class of 2018 for getting through last year and for achieving what you have. I wish you the very best of luck with your future studies, work or travels. Thanks so much for having me here today.